Colonel Christopher Gadsden created the flag in 1775 for then commander-in-chief of the Continental Navy Commodore Esek Hopkins, to fly on his flagship. Before getting any deeper into the history of the Gadsden flag, we’ll take a look at the symbolism of the rattlesnake in colonial America. Prior to and during the revolution, the eastern diamondback rattlesnake was very prevalent throughout the colonies. Benjamin Franklin first used the rattlesnake as a symbol of the colonies in a 1751 satirical cartoon and continued using it for several years. His most notable use was in a 1754 cartoon depicting a snake cut into 8 sections representing individual or groups of colonies, underscored by the phrase “JOIN, OR DIE.” As support for independence grew, so did use of the rattlesnake symbolism. The first use of the coiled rattlesnake on a yellow field and the “Don’t Tread on Me” motto was not on any flag, but a drum. Painting drums with unique regimental symbols was a common practice at the time. It is believed that Gadsden got the idea for his flag design from the first marine raiders enlisted in Philadelphia who painted their drums very similarly to what would become the Gadsden flag. Gadsden represented South Carolina at First Continental Congress in Philadelphia and was a member of the Congress’ Marine Committee, making this theory plausible. State militias in Virginia, Pennsylvania and Rhode Island used the flag, or variations of it, throughout the American Revolutionary War. Probably the most notable variation is The First Navy Jack of the United States. 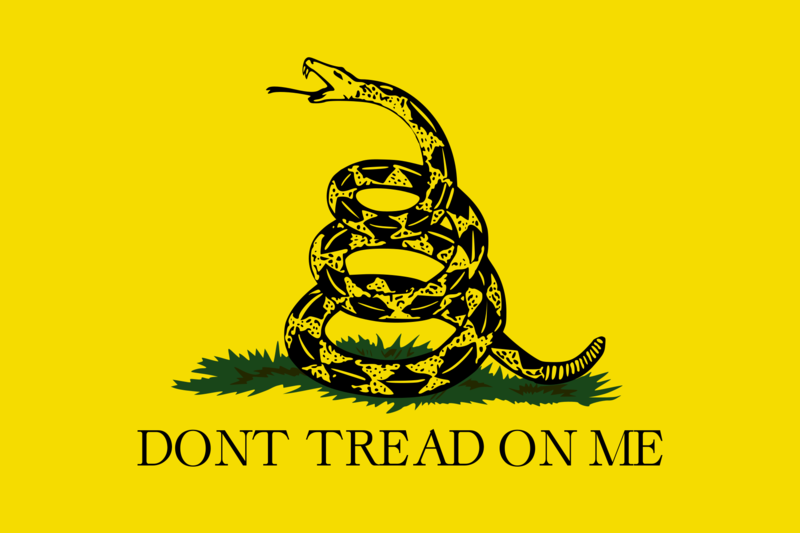 It features an uncoiled rattlesnake over a field of 13 red and white stripes as well as the “Don’t Tread on Me” motto. Oddly enough, the jack was created by English artist Thomas Hart. Many speculate that Hart created the design as an insult, as if “Don’t Tread on Me” was a plea to take mercy on a weak American Navy. Others say that the motto is used as a warning not to provoke the Navy, supported by the fact that the snake is out-stretched as if it’s striking. The flag was first used as the Navy Jack until 1777 and then was reinstated on September 11, 2002. Today, the Gadsden symbolism is still very prevalent in American culture and often associated with Libertarianism. The Free State Project, a movement to get 20,000 Libertarians to move to a low population state to create a Libertarian stronghold, is represented by a modified Gadsden Flag that replaces the snake with a porcupine. In 2009, the Gadsden flag began appearing at Tea Party rallies and has since been strongly associated with that group. The U.S. Men’s National Soccer Team also uses the motto “Don’t Tread on Me” and has featured coiled snake details on some of their most recent uniforms. The flag is still popular in Gadsden’s birthplace, Charleston, South Carolina. It is also where Gadsden first presented the flag to the South Carolina Congress in 1776.